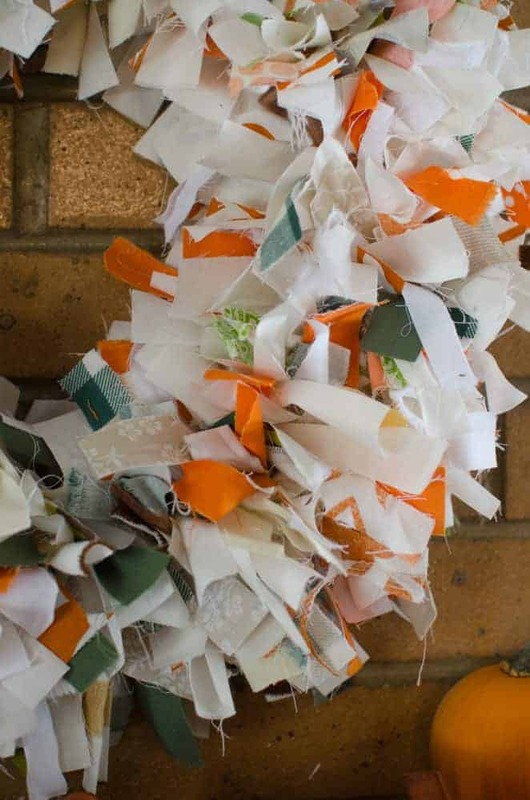 A DIY Fall Rag Wreath is an easy way to use up your fabric stash and get your house decked out for the season. Pop in a movie and get to tying that fabric! We’re taking a break from all the food to bring you a fun little craft project. The gardens are done for the year and it’s getting colder outside, so now it’s time to find indoor projects to work on. Fall decor, handmade Christmas, and catching up on my reading list are the first things I go to in the colder months. 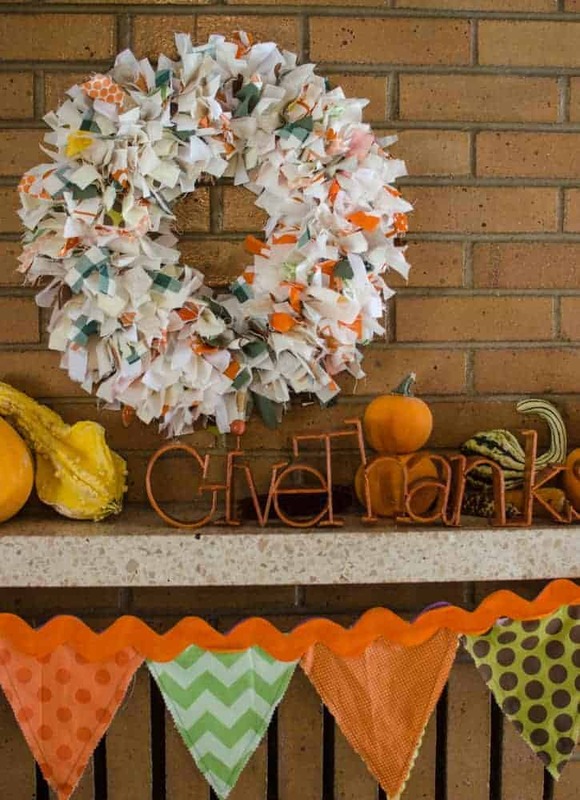 I loved this project and I think my DIY Fall Rag Wreath turned out really cute. I only used things that I already had on hand, which means it cost me nothing to make. In fact, I made two! One for my mantle and one for my front door. Our dream house will have double front doors, so I thought I might as well make two for “one day!” Give me two more years, and these wreaths will be on those fronts doors. I had this grand vision of all the ways I would style this rag wreath for my photos. I thought of it hanging on a pretty colored front door, gracing a vintage door handle, leaning on a perfect mantel, and perched on the back of a dining room chair in a beautifully decorated kitchen. Then I started to take pictures, and reality set in. I have an unpainted white door that’s full of stains and finger prints (primer isn’t known for great washability and the thing has never been painted). I have no dining room chairs, just folding chairs and piano benches around my table. Here’s what I’m getting at: I’m pretty good at styling pictures, but that doesn’t mean I live in a magazine. I sure hope our dream house will be gorgeous, but for right now I live in a little rental that’s a bit on the dumpy side. It’s drafty, has more mice than I’d like to admit (I’ve caught 6 this week! ), and my bathroom is in my bedroom – yep, you can sit on the toilet and see my bed (really!). It’s quirky, old, and kind of dirty (the 5 kids living here doesn’t help much). One day I’ll be cooking in a lovely kitchen with a large island, new appliances, and a fancy backsplash lining the walls. In the meantime, I’ll be cooking in a homey kitchen full of sticky little fingers and a stove with three burners that work and a fridge held together by duct tape. Don’t let the pictures fool you – I’m pretty normal. 1. Cut your fabric into 2 inch by 6 inch strips. 2. Bend and shape the wire hanger into a circle. The hook makes a perfect wreath hanger. 3. Tie the fabric strips onto the hanger. Scrunch them together tightly as you go. You can single or double knot – it doesn’t really matter. 4. Put on a movie and tie, tie, tie! 5. Continue to tie and scrunch the fabric together until the wreath is as full as you’d like. Fluff and twist the fabric so that it pokes out all over – the messier the better. You can add a bigger bow to the top where the hanger neck is, if you like. You can’t mess this up. It’s a great project for just about anyone who can tie a knot. When it comes to fabric, buy or find a few that go well together and then throw in a few patterns that you might not adore on their own. 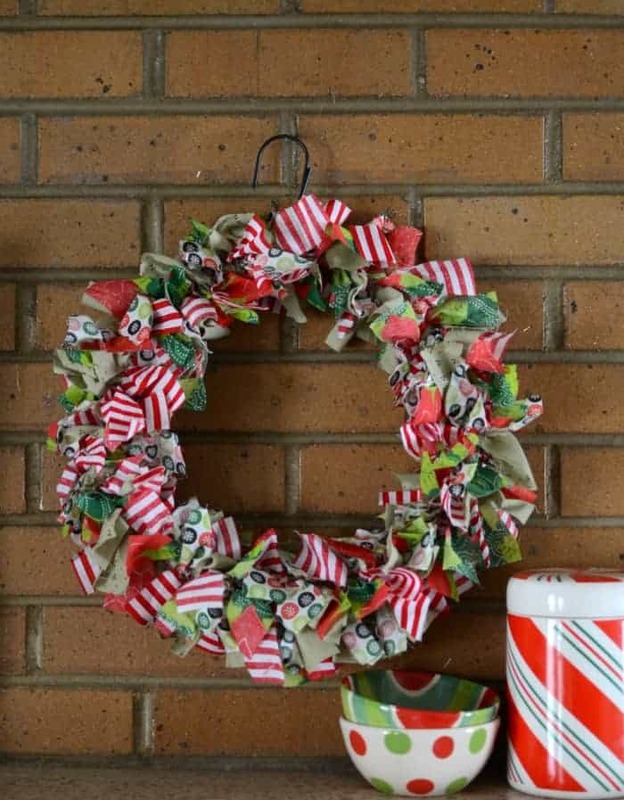 Variety is what makes this rag wreath interesting. I did a lot of neutral colors (beige, tan, off white), and then I threw in oranges and greens. I do wish I would have found a darker tan or brown because my neutrals blend together more than I thought they would. I used all kinds of scraps, including an old pair of corduroy pant legs! This is a great project to use up things in your own cloth pile, so don’t feel like you need to go out and purchase fabric. Shopping your stash is much cheaper. Bonus: it stores great! Just fluff it well before using again. So cute! I hope you make a million. This would be a great project for kids to make for their teachers or grandparents too. I hope you know that your honesty about your home helps so many of us breathe a sigh of relief ?